A broken spring isn't just one of the most common problems garage door owners can experience; it is also one of the most dangerous ones. The reason for this is that the door relies on these components to support and counterbalance its weight, and when they fail to work properly, the entire panel system can come crashing down. Naturally, this is incredibly dangerous, but those aren't the only risks. The spring itself can whip around when it breaks, and cause severe lacerations to anyone unfortunate enough to stand in the way. That's why you need to make sure you know what to do when something like this happens, and how to avoid the situation entirely. 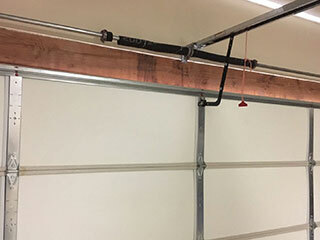 A garage door spring can break for a variety of reasons. As we mentioned before, these components support and counterbalance the door's weight, meaning they are under a lot of pressure on a daily basis. Every time you open or close the door these parts are working, which results in wear and tear buildups that gradually cause them to grow weak until they eventually break off. Rust is another potential culprit, and if your garage door springs aren't galvanized, they will be more likely to suffer from this issue. Regular inspections and lubrication maintenance will do wonders for your garage door springs. Not only will they be able to work more smoothly and silently, but you'll be able to notice they're getting ready to break and get them replaced in due time, thus avoiding the inconvenience and risk of having a spring suddenly break. Regular balance tests are also important, and they allow us to tell whether or not the spring tension needs adjustment, which is another way of mitigating some of the stress these parts are under on a day to day basis. When you find that one or more of your garage door springs have broken, the first and only thing you should do is – call a professional. These units are very dangerous to handle, especially if you lack the proper training and experience. Our experts are more than equipped to handle both extension and torsion spring replacement and repair, and we provide same day emergency services exactly for these sorts of situations. Don't hesitate to contact us when faced with such a problem. Is your garage door frustrating you? We’re the company to get it fixed! Our highly trained technicians will figure out the problem and get your door working again in no time. From spring and opener repairs to cable, roller and other part replacements, we do it all! At Garage Door Repair Oviedo, your satisfaction is our guarantee! Offering same day services and top quality products, our team is always at your service. Thank you for choosing our company! Feel free to browse our website for more information in the meantime. Our team at Garage Door Repair Oviedo is at your service any time!